Dear reader, it is a bittersweet day. 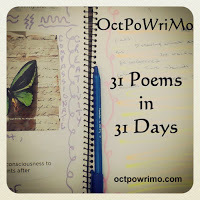 Today marks the end of #OctPoWriMo. I can honestly say that I am a bit sad about this. Every day for the past 31 days, I have written a poem based on a prompt from one of our wonderful organizers. Every day I have pushed myself. Somedays it came easy, some days I struggled mightily. But, I did it. And I am proud of it. I probably wrote close to 40 poems in the past 31 days. Knowing what I have done serves as motivation for what I need to do...I need to write. It's in my blood. Thank you to the organizers and prompters for taking us on this fantastic journey of poetry. Julie, Morgan, Amy and Tamara...thank you. If I missed one someone, I apologize and offer you a special thank you as well. Thank you to all the poets who contributed their poetry. Reading your work gave me so much inspiration. I have made new friends, and for that I am grateful. Also thank you to all those who read my work. I am humbled that little ol' me could write something that so many enjoyed. I hope our journey together doesn't end here. And that, dear reader, brings us to my final poem of #OctPoWriMo2014. As the tears fall from my eyes, and as my heart beats a little bit faster, let me say that it is finished. to all who cared to see it. Thank you so much for always stopping by, Fifi! It has been much appreciated this whole month. My inspiration comes from all the folks I've met this month. Thanks for your support, Payal! Jessica, you know how much you've meant to me this month. Thank you for everything...we're only just starting!! Aw, Lizzi...thanks! It has been, and will continue to be, wonderful interacting (and hijacking!!) with you!! Thank you very much! This was my first go-round as well. Definitely want to do it again. Wow, thank you very much, Christine. I am honored you stopped by, and that you like my work!!! I'm so glad you dropped by, Angela. And yes, we will definitely stay in touch. Thanks for all the feedback!! I agree, a bittersweet day. I felt compeltely lost today! Felt strange not having to write today. I almost feel terrible that I wrote nothing!